Air Pacific, Fiji’s national carrier, stated that despite recent challenges and a number of restructuring changes, it aims to return to profitability and maintain operations. 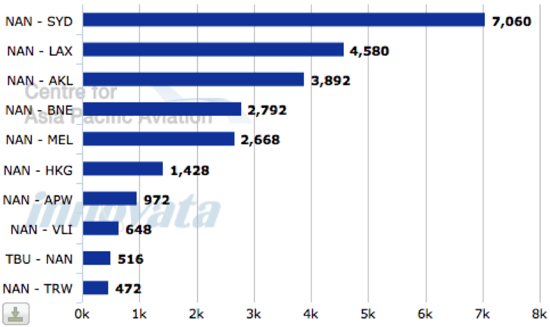 High fuel prices and increasing competition from LCCs, including Virgin Australia and Jetstar, has hurt Air Pacific, with the airline reporting its largest full-year loss last year at FJD90 million (USD51 million). Air Pacific once dominated the lucrative traffic into Fiji, a remote South Pacific archipelago and popular tourism destination. 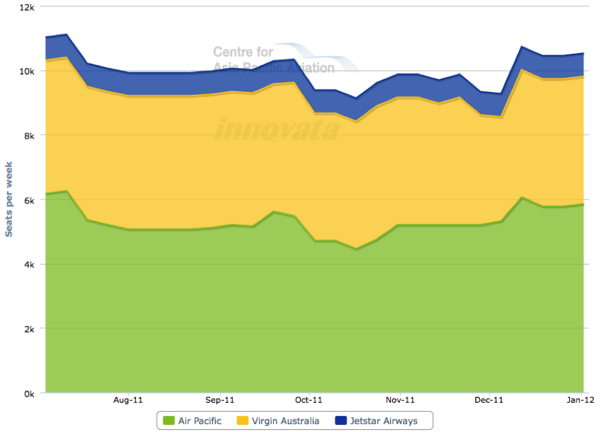 While still the largest carrier in the market, Air Pacific has struggled to compete since the arrival in 2009 of Virgin Australia and Qantas LCC subsidiary, Jetstar, and has seen a 51% erosion of its market share. 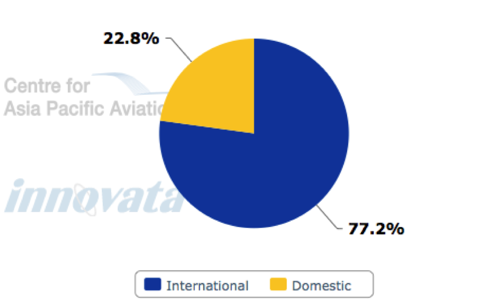 LCCs now hold an 18% capacity share of the Fiji market, although the figure is higher on international routes to/from Fiji. 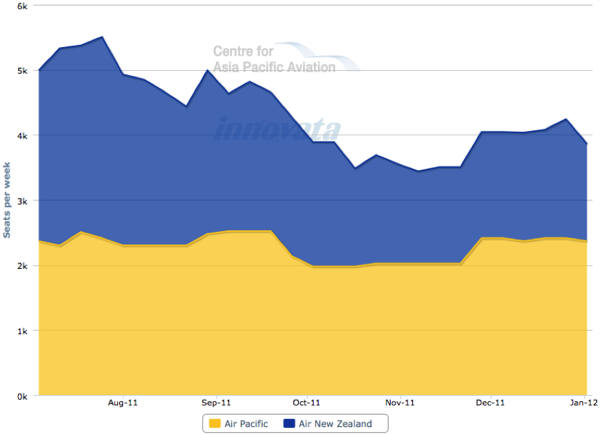 Air Pacific has also been affected by the global financial crisis, flooding in Fiji and losses on fuel hedging. Air Pacific CEO Dave Pflieger, who has held the position for the past 12 months, stated he would not let the airline fail and has introduced a downsizing and restructuring programme to improve the carrier’s competiveness. In an interview with The Fiji Times on 16-Jul-2011, Mr Pflieger stated his aims for Air Pacific include returning it to profitability, ensuring an enjoyable flying experience for customers and making the airline a good company for employees. The restructure was deemed necessary to sustain the longevity and sustainability of the airline and to ensure it can effectively compete on a global scale. As part of restructuring, Air Pacific is implementing a three-pronged approach: having the right skills and expertise; improving the basics such as safety, OTP and customer service; and improving infrastructure, fleet, schedule, network and bringing costs under control. This also involves staff rationalisation and is necessary as Air Pacific is one of the largest foreign income earners in the country. Air Pacific stated it would add another B737-800 to its fleet in Nov-2011 and plans to return its leased B767-300ER by mid Jan-2012. The airline is expected to also replace its two B747-400s in 2013 when the lease expires. The carrier is also revising its schedules in order to “significantly” boost access to the budding Australian market and to add more seats to Hong Kong and New Zealand. "Replacing our 1994-vintage B767-300ER with an almost new B737-800 is the first step in Air Pacific's fleet renewal process. The additional B737-800 will significantly improve flight schedules to our key Australia market, and it will allow us to put our B747-400 back into Hong Kong, adding much needed seats to this fast growing route," Mr Pflieger said. The carrier plans to boost the number of weekly Sydney services from seven to 13 (10 weekly B737 and three times weekly B747-400 service) to enable same-day connections from Nadi International Airport to Fiji’s outer island resorts and hotels, improving the access to Fiji’s smaller airlines. 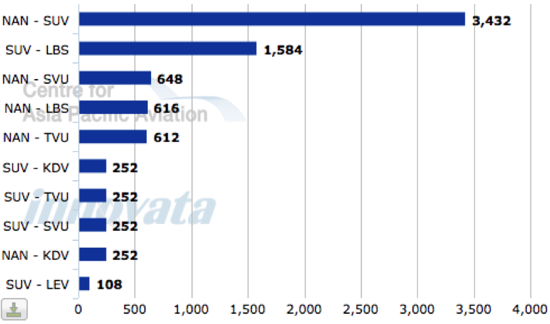 The changes, which will become available from 20-Jul-2011, come as tourism numbers to Fiji continue to rise. Nadi-Sydney service is the carrier’s largest international sector. 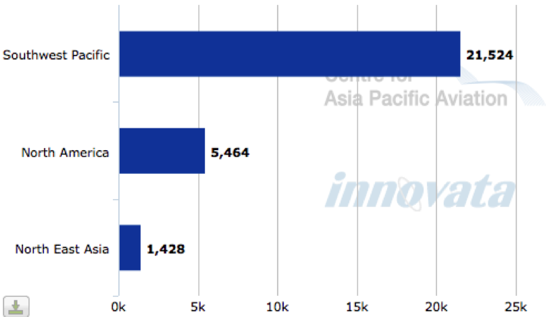 More than 27,000 Australians visited Fiji in Apr-2011, a 27.6% year-on-year increase. In 2010, Fiji was Australia’s seventh largest outbound markets, with 311,100 departures, a 28.4% year-on-year increase, according to Australian Bureau of Statistic. Over the period 2001 to 2010, short-term resident departures from Australia to Fiji grew faster than any other market, at a rate of 14.2% p/a, according to Tourism Research Australia. 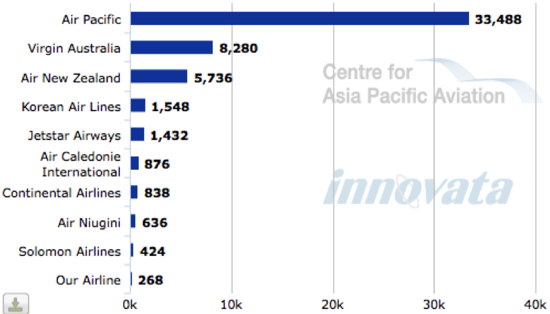 Meanwhile, the Hong Kong route from Jan-2012 will be flown by B747-400s allowing Air Pacific to add an additional 165 seats (22%) per week of capacity into this market. “Since the B747-400 is much larger than the B767-300ER that it is replacing, we will initially revise our schedule to two flights per week; but we look forward to adding another B747 flight to Hong Kong when demand calls for it,” said CCO Josef Loew. Air Pacific is the only carrier operating between Air Pacific and Hong Kong. For Nadi-Auckland, the 2012 flight schedule will remain unchanged, but Air Pacific will increase seat capacity on this route by increasing B747-400 service from one to three flights per week. Air Pacific is the largest carrier on Fiji-New Zealand services, with the market being a duopoly with Air New Zealand the only other operator between the countries. 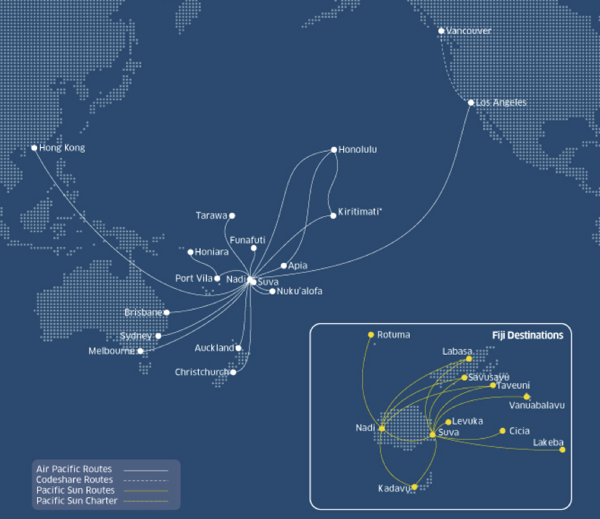 In other network news, the carrier plans to increase capacity on Nadi–Christmas Island–Honolulu weekly service in Sep-2011, with the service to be operated with B737-800 instead of B737-700 equipment. The carrier also launched Nadi-Rarotonga service earlier in the year. The Cook Islands-Fiji route was previously serviced by Air New Zealand. 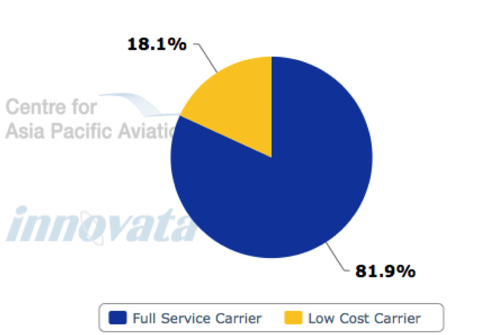 Around 77% of the carrier’s capacity is deployed internationally, with international services feeding into the carrier’s domestic network. To reduce costs, Air Pacific is renegotiating every contract it has entered, including employee contracts. The carrier has hired its own procurement officer and attorney to assist in this challenging task. Mr Pflieger added that if Air Pacific does not have a competitive arms-length contract in place, the airline would either cancel the contract or renegotiate it. Mr Pflieger said hundreds of contracts would be renegotiated as the absence of an in-house attorney has meant that previous contracts had placed the airline at a disadvantage. The key challenge, however, remains the renegotiation of staff contracts. Mr Pflieger said redundancies could be avoided if unions could come to an agreement with the airline. Mr Pflieger said the airline had planned to commence redundancies when its voluntary separation programme was completed. He has instead offered the unions profit sharing and no redundancies if the unions agree to revising union contracts so that the airline could cut costs and compete with other airlines. Unions have labelled the CEO’s restructuring efforts as requiring "draconian" changes, to which Mr Pflieger replied, "draconian times require significant changes". He added that the carrier has “been trying to negotiate with the unions for five months and we're in an impasse". Mr Pflieger stated that for the airline to survive, the staff must make some sacrifices to ensure it returns to profitability. Already, 20 employees have had voluntary redundancy package applications approved. The carrier has also requested unions produce a contract that would work in the face of competition and rising fuel prices. The carrier is also focussed on improving its on-time performance, which resulted in the enforcement of strict check-in times from Sep-2010. A month after the new system was introduced, the airline recorded its best on time performance rate of 90%. The carrier has also improved its reservation system. Qantas Airways, meanwhile, appears to be struggling to sells its stake in Air Pacific to the government of Fiji more than a year since the sale was first raised. According to Dow Jones, Qantas wants the government of Fiji to pay FJD70 million (USD40 million) to acquire out its stake in the carrier, although the government only appears to be willing pay a fraction of this figure. According to the reports, the Fiji Government is wanting to pay Qantas around FJD1 per share for the Air Pacific stake, compared with the price Qantas is asking of close to FJD5.50 per share. Concerns have also reportedly been raised about the codeshare element of the agreement. As part of its written proposal, Qantas said it would continue to codeshare on Air Pacific-operated services to Australia, New Zealand and the US (the carrier also has codeshare agreements in place with Alaska Airlines, Air New Zealand and Cathay Pacific and a FFP partnership with American Airlines). Qantas also offered to step down from Air Pacific's board and be "pleased to provide" two Qantas executives, Simon Hickey and Paul Edwards, as "advisers" to Air Pacific. Qantas, according to the Dow Jones report which cited a copy of the proposal from Qantas to the Fijian government last year, has recommended the carrier either cancel new aircraft orders; sell and lease back aircraft; refinance a hangar; and sell the Sofitel Hotel on Fiji's Denarau Island to fund the acquisition of the 46.3% of Air Pacific owned by Qantas. Fiji's government is the largest shareholder in Air Pacific with a 51% stake. In a recent interview, Qantas CEO Alan Joyce commented only that Qantas was "still talking to the Fijian government about the future shareholding. Those dialogues will continue but there's nothing more we have to say on that at the moment." Air Pacific was established and started operations in 1951, under the name of Fiji Airways. Qantas purchased Fiji Airways in 1957, but in 1960, when Fiji gained its independence, the Fiji government took an equity stake, together with Air New Zealand (then TEAL) and British Airways (then BOAC). In 1971 the carrier became "Air Pacific", a more generic name - chosen at least partly in a bid to establish the airline as a regional hub carrier, which could represent the interests of the many small island nations, which find it difficult to maintain viable stand-alone airlines of their own. Regional rivalries and a general desire for all countries to maintain their own flag carrier meant this aspiration was never realised, even though small airlines of various neighbouring countries have failed and been forced to close their doors in intervening years. In 1984, Air Pacific itself had expanded its long-haul routes at a rate which rendered it technically bankrupt, causing the Fiji government to invite Qantas to enter a support agreement to bolster the airline, through the provision of training and management. Right throughout the 1990s, Air Pacific was a notable success, being profitable in every year – until a military coup in 2000 reversed its fortunes, with a large drop in tourist numbers plunging the carrier into loss. This was short lived, and Air Pacific stormed back to profit the following year, with the only glitch since being a barely profitable year in 2006-07, before another strong result in 2007-08. In May-2008, the Fiji interim military government announced that a Cabinet Task Force had been established to review the airline’s performance. This was to include a review of the shareholder’s agreement between Air Pacific and Qantas – which was widely interpreted as a signal of dissatisfaction by some Fijian officials. Since the review was announced there have been several changes in Cabinet membership, and no apparent progress on the review. While various shareholders have come and gone over the years, Air Pacific is now owned by the Fiji Government (51%), Qantas (46.32%), with minor stakes held by Air New Zealand (1.94%) and the governments of Kiribati (0.27%), Tonga (0.27%), Nauru (0.08%) and Samoa (0.12%). Meanwhile, Air Pacific acquired Sun Air, a domestic airline, in 2007. This carrier formed the basis for Pacific Sun, now Air Pacific's domestic and regional subsidiary.